CONGRATULATIONS! YOUR SEARCH FOR THE PERFECT CERAMIC MAGNETS IS OFFICIALLY OVER! There is no need to worry about magnets' power, resistance and reliability anymore. We invest tremendous amount of time and effort researching, developing, and controlling the quality of our industrial magnets. Practical Dimensions - Large magnet diameter 12/17" & Small magnet thick 3/15" ready to be used flat circular magnets for all your needs. Best price/quality ferrite magnets - in comparison to more expensive rare earth or neodymium magnets. 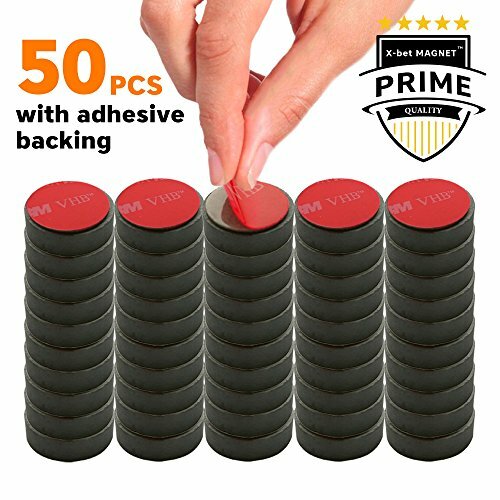 50 pcs high quality craft magnets with adhesive backing satisfies the requirements of ISO 9001. Force - Grade 8, 4200 Gauss. Our tiny magnets are the strongest ceramic magnets you can buy. X-bet Strong Sticky Magnets don't lose their power. High Resistance to Thermal Stress to Corrosion & Oxidation. Self Adhesive Magnets can be glued on to any surface. Our circle magnets do not peel off with time. Flat Sticky Magnets Great for all Home, Office, Craft, Hobby, Science Projects and Product Manufacturing applications. Perfect for glass gems, mirrors, for making refrigerator magnets, bottle cap magnets, small signs, magnetic buttons, and much more. Also Our Craft Magnets are used as kitchen magnets, office magnets, science magnets, classroom magnets, fridge magnets, diy magnets and hobby magnets. By Buying our Disk Adhesive Magnets you can be sure in 100% result!